I have many things on my to do list, and retail therapy ranks right at the top. I love State Street “that great street” as the song goes. Imagine my delight to wander in to a brand spanking new Anthropologie. It was very exciting and stimulating, both their product as well as merchandising. The picture is of a rustic ladder. 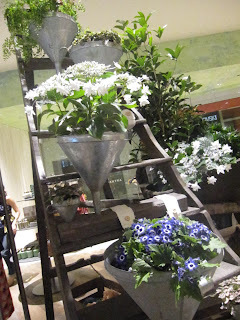 They put plants in large industrial funnels and terraced them up the rungs of the ladder. I love this store and every time I go I am inspired. And that was just a short peek at my first day in the Windy City. Last time I was in Anthropology, I took pics of a display they did with paper airplanes. I am so going to do that some time! Darhling, it's EM2. Thank you for your mention of me in the blog. Yes,I so enjoy being with you and the rest of AIFD Superheros. Sounds like you and family had a smashing time in Chicago. GOOOOD. Congratulation on your recognition received. You are very good with your work and your dedication and energy radiates through the blog. Remember to study through the 6 pages of superhero ideas and set goals towards positive change. "Go, Confront the problem. Fight, Win". No cape. OH.. please say hello and give a big kiss to Evie for me.